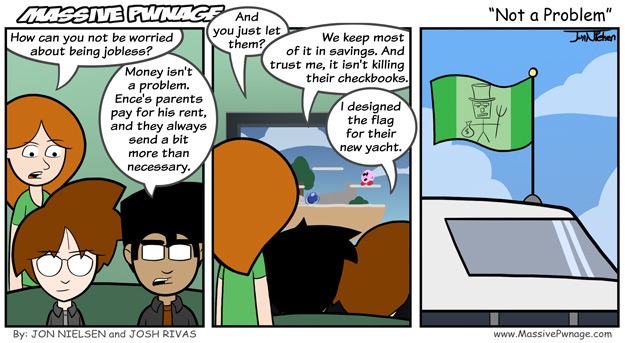 Hopefully you can tell that it’s a yacht in the last panel. I was going to draw it smaller, so you could see the whole thing, but then you wouldn’t be able to see the flag. The flag is very important. I still can’t figure out how I want the font to look. I’m thinking about getting a new one again, but I don’t know. Maybe a fancier one. Though, it’s hard to find a nice comic font that has upper and lower case. I like lower case. It’s good. This entry was posted on Friday, August 8th, 2008 at 12:00 am and is filed under Comics. You can follow any responses to this entry through the RSS 2.0 feed. Both comments and pings are currently closed.